Full control of the standard SEO Fields. Title tags, Keyword and Description Meta tags are all important in the SEO process. Some more than others, none the less we want to use every technique possible. Every file should have a unique title tag designed for the content on page. Keywords and Descriptions are used in various ways by the different Search Engines. The SEOTrack CMS provides you with the ability to do this. Although it is tedious, filling in all these fields is an essential part of the SEO process. 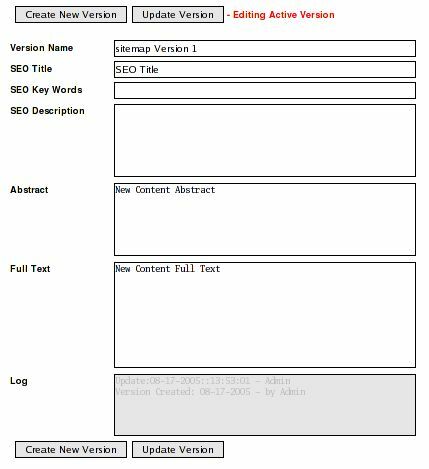 The Abstract and the Full Text fields can be used in multiple ways. Depending on how your site is set up, you can have the abstract show up in one part of your page and the full text in another. You can also set it up so the text is used on other pages through the use of our custom tag set.